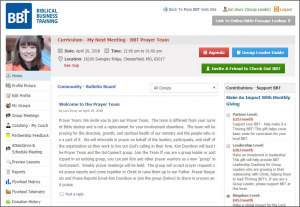 Lead a small-group Bible study by providing your profile and group information. Sign up to receive email communications or follow us on social media. 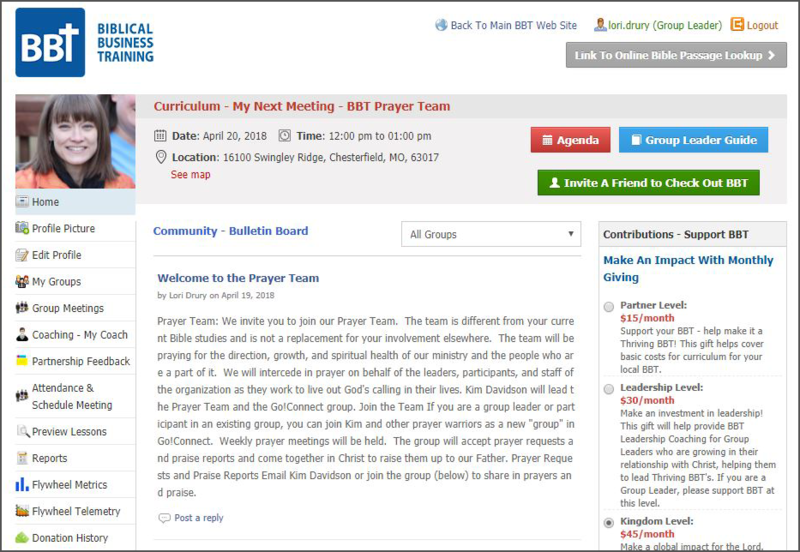 A web-based platform distributes the Bible study curriculum, meeting details, and private group communications. People are so busy. You have taken the 'pain' out of leading a Bible study." If we run our business with a Christ-centered approach, it benefits everyone in its wake ... our families, our team members, our clients, our brands." ... and thank you all for BBT. The topic and our discussion applied to so many different areas in my life right now, and I am incredibly thankful for this group and the opportunity to share God's word with one another." ... with others, but has encouraged me to dig deeper and learn more on a deep personal level. I love the heartfelt accountability that is shown from the group as we continue on the highway of God's journey. The curriculum is spot on for both business, home and personal application. On the rare occasion that I miss a meeting, I truly feel a void. It is also fun preparing for our weekly meetings and this quiet time has proven to richly bless me and my walk. I can not thank you and all who are involved with BBT for serving our God enough." ... BBT makes it to send recap/reminder emails and track attendance. Having a full time job and a family doesn't spare me much time so having the recap email already formatted for me to send is a great time saver!" Tools to equip and empower yourself and others. Go!Connect (formerly Portal) is a unique feature of BBT – it’s the online small-group tool that brings together Curriculum, Coaching, Connectivity, and Contributions … all into one place! 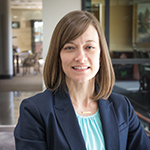 This practical tool reduces administrative time and increases consistency. The Go!Connect gives everyone in the group access to the Agenda and enhances fellowship, encouragement, and accountability. The quick start guide helps new group leaders and participants through specific questions when setting up a Go!Connect account (formerly Portal). Welcome to BBT! 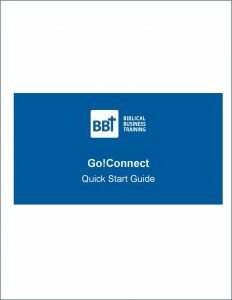 This training contains instructions for setting up a Go!Connect account (formerly Portal).